Photoshopped by yours truly. 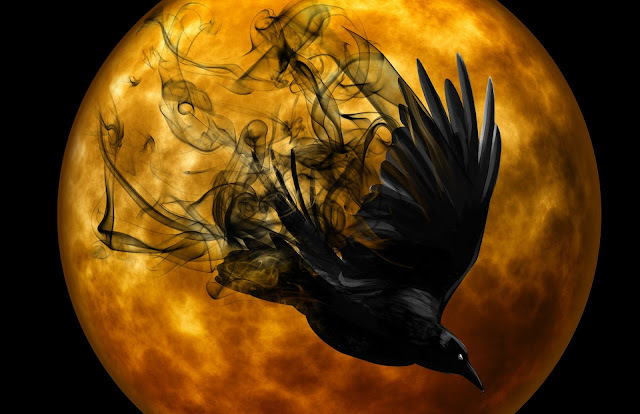 I don't own the words, as they belong to Edgar Allan Poe, nor do I own the picture of the raven. 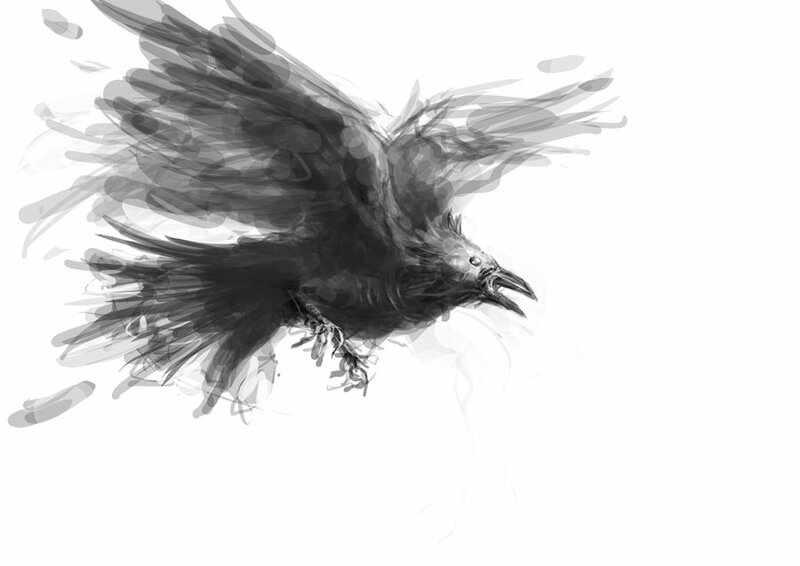 'Tis from http://csicreativesceneinvestigation.files.wordpress.com/2013/04/sketch__undead_raven_by_michifromkmk-d5n804p.jpg. Since I shared this with the folks at Runaway Tales on LJ, I figured I would share this with you lovely folks on this blog, too. 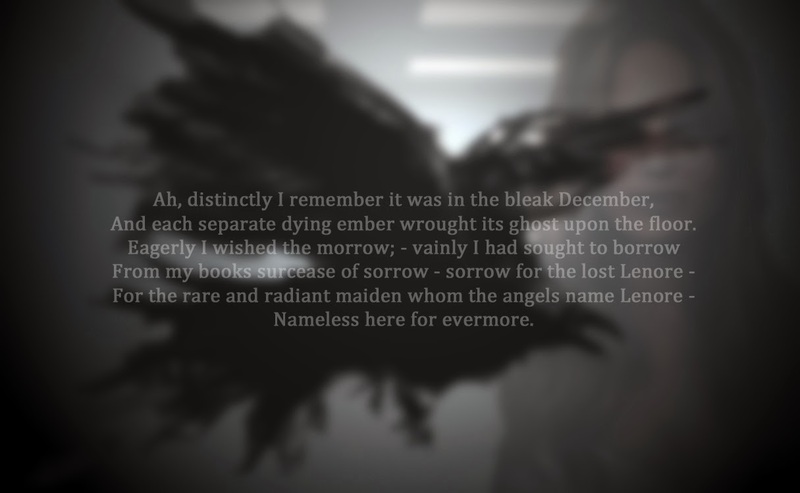 It is Chapter Six of The Omniscience, written from Lilah's perspective, and was initially inspired by the prompt, "all that we see or seem is but a dream within a dream" (a Poe quote), but eventually wound up being more about Poe's The Raven through the very complicated series of events that is the writing process. Darkness surrounded her, pressing in against her skin, but somehow she knew what was around her, where she was. Inside the Omni. Of course. But it was different now, warped from its true nature, and everything was twisted into terror and nightmares. She knew this even though she couldn't see anything, or hear anything. It was all just darkness, her, knowledge, and the Machine. And she was walking, walking down the longest corridor of her life and never stopping. There had to be an end, and she would find it. All she wanted, more than anything else, was to leave this forsaken place. But no. No, she had to find Anna, bring them both out of the depths. Anna was here somewhere. There had to be Anna, and she would find her. They weren't words now. They were screams. Blood was dripping at her feet. She was in another room and blood, thick and warm and wet, was pooling at her feet. Was it hers, the blood? A man's whisper came from behind her. She turned around. He moved behind her again in the blink of an eye. They circled each other, his body just out of her line of sight, his words just out of her range of hearing. But it grew louder, slowly, and she could recognize the voice now, if not the speaker, for she somehow knew the voice was being borrowed. But by whom, and to what end, she didn't know. Crack. Lilah whirled around and saw the blood was flowing from a fountain in the center of the room. A fountain of blood. She moved toward the fountain only to find a body, spilling blood from everywhere. Delia, she first thought, but it wasn't Delia. She pulled back the matted blonde hair that covered the girl's face and found two hazel eyes staring back at her, dulled. She waited with frantic heartbeats. “Lilah.” The girl's hand moved up to touch Lilah's cheek and she tried to smile, but it only came out as a tortured grimace. She was in pain—she was in agony. When she awoke, she couldn't move, only lie there on the battered couch and stare at the ceiling, the dream's last words playing over and over in her mind. Quoth the raven, nevermore. Who had said that? Who had been saying that poem, and why? Why a poem? Why that poem? She took in a deep breath. Her eyes darted from side to side now, confirming for her what was real and what wasn't. Yes, the room was still lit by that pale blue glow. Yes, Becca was still there, still asleep on the remains of an armchair with a bloody bandage around her leg. Yes, she was safe. For now. No, Anna was not here. No, Al Peren had not been reading poetry. No... It was a dream. That was it. There was still no way of knowing if Anna was alive, no way of knowing anything beyond right here, right now. Poe. Again. Why was she thinking about Poe? First the Raven and now this—Poe was all over her brain. Tugging at it, gnawing at it. Edgar Allan Poe. What did it mean? Lilah could stand now. She walked towards the kitchen, stepping around the hole where the metal thorn had torn through the floor. A headache split the center of her skull. She furrowed her brow. The water faucet was still working. She filled up a cup and sat at the corner table, lined with dormant gray screens and built for one. The Omni hadn't accounted for a visitor. Becca had been unexpected. Spontaneous. Becca was like that most of the time, apparently. If she were more like Becca, would she have been able to save Anna? No, that was a stupid thought. It wasn't real. It was just a dream. Anna might not even be in here still. And there was no way to “save” her, whatever that meant, without going back in time. Lilah placed down her glass and ran her fingers along the surface of the table. It looked all solid gray, but it still felt like grained wood. She wasn't asking just her subconscious anymore. Fresh air, she needed fresh air. Or—space. Or something. She was suffocating in here, where the dulled screens didn't look the same way they felt. Almost like something in a dream, she thought. And then Poe was back.